Throw Pillows - Beautiful Colors and Patterns! Want a quick tip on adding a splash of color to any living room or bedroom decor? Choose a few colorful decorative pillows and place them in your living room seating arrangement or on the bed in your bedroom. Add a single throw pillow to your favorite chair. 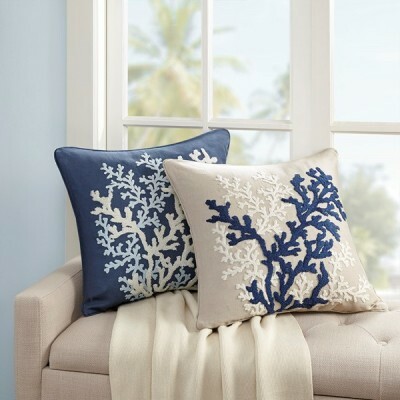 Our coastal collection includes a wide range of ocean and nautical themed decorative pillows in a variety of colors making it easy to find something suited for your décor. The nice thing about accent pillows are the fact that they can have a very dramatic effect on the feel and overall color scheme of that room and that they can be changed out easily at any time. In fact, many people keep their homes fresh by changing out pillows sevaral times a year. Of course, there is always that favorite pillow(s) that you love and cherish and keep around forever. Many coastal style homes tend to have a neutral palete making color that much more important. Don't know where to begin? We would love to help with that process. Another suggestion is to search around for rooms on Pinterest or magazines that inspire you and try and duplicate that look. Although, it's perfectly acceptable to let your unique and creative personality guide you. So many times though you just know that right accent pillow when you see it. Pacific Home Furniture’s Anchor Pillow is perfect to add a nautical touch to any se.. Anchors Away Navy!Pacific Home Furniture’s Navy Anchor Pillow is a unique pillow for any r.. Decorative Embroidered Coral Pillow Bring a sense of the sea side into your home with t.. This Beach Pillow from Pacific Home Furniture is fun for any room of the house or would be a perfect..
Pacific Home Furniture’s Life is Better Pillow is a unique pillow for any room of the house or..
Lovely Mermaid Accent Pillow!This Coastal Inspired Mermaid Decorative Pillow Feat.. Anchors Away (Blue)-This Nautical Inspired Blue Anchor Decorative Pillow Is Bright And Chee..
Blue Seahorse Coastal Pillow-This Coastal Inspired Blue Seahorse Decorative Pillow Is All Cotton..
Embroidered Coral Decorative Pillow-Oblong The Harbor House Cannon Beach Cotton Em..
Embroidered Coral Decorative Square Pillow Accent your home with the Harbor House Canno..
Chevron Decorative Pillow The Intelligent Design square decorative pillow features a ..
Sea Side Coral Accent Pillow Bring a bit of sea side inspiration into your home ..
Sea Side Accent Pillow Bring a bit of sea side inspiration into your home with this b..
Sea Side Shell Accent Pillow Bring a bit of sea side inspiration into your home with ..
A Seaside Classic Accent Pillow!This Coastal Inspired Conch Shell Decorative Pillow Is All ..
Coastal Crab Decorative Pillow-This Coastal Designed Crab Decorative Pillow Is Bright And Cheerf.. This Colorful Dragonfly Decorative Pillow Is A Perfect Accent For Any Style.Made Of Al.. Ocean Wave Oblong Accent Pillow Bring the ocean into your home with the Harbor House ..
A Seaside Favorite Coastal Pillow!This Coastal Inspired Mosaic Starfish Decorative&nbs.. Ocean Waves PillowPacific Home Furniture’s Ocean Waves Pillow is a unique pillow for any r.. Ocean PillowPacific Home Furniture’s Ocean Waves I Pillow is a unique pillow&nbs.. Ocean PillowPacific Home Furniture’s Ocean Waves II Pillow is a unique pillow for any room.. Plush Aqua Accent Pillow This Madison Park square aqua accent pillow features a .. Plush Grey Accent Pillow This Madison Park square grey accent pillow f.. Plush Navy Accent Pillow This Madison Park square navy accent pillow f.. Plush Tan Accent Pillow This Madison Park square tan accent pillow fea.. Anchors Away (Red)-This Nautical Inspired Red Anchor Decorative Pillow Is Bright And Cheerful Wi..
Red Lobster Coastal Pillow-This Coastal Inspired Lobster Decorative Pillow Is Bright And Cheerfu.. Decorative Embroidered Coral Pillow Breathe life into you decor, with our Harbor House ..
Sea Turtle Coastal Pillow!This Coastal Inspired Sea Turtle Decorative Pillow Is Made Of All..
Sea Weed Decorative Pillow!Sea Weed Pillow from Pacific Home Furniture is a cute pillow for any ..
A Seaside Accent Pillow!This Coastal Inspired Spotted Grouper Decorative Pillow ..
Coastal Colored Stripes Pillow!Pacific Home Furniture’s Stripes Pillow is a cute pillow fo..